For the past few months I’ve been looking for some kind of ritual that resonates with me. I needed something to bring some stillness in my life before I start my day and a way to connect to the universe around me. I spent a little time talking to a friend of mine who is a yoga teacher. She had completed a 40 day meditation and I was impressed with the discipline she had to complete it. She stressed the importance of being consistent with a practice so that it becomes ingrained, start with something simple, and see where it takes you. This is interestingly and not surprisingly how we start all of our new endeavors. it was good to hear that this works with meditation just as it does Aikido, T’ai Chi, ballroom dance, guitar, or anything else I’ve tried. With regards to the specific needs that I needed to fill, I think I found it! we repeated this through the rest of the mudras. This was an amazing practice, and it was just what I needed to incorporate into a ritual that resonates with me and allows me the ability to connect. As someone beginning a practice, I stick with the obvious, I don’t try to go to more esoteric levels right now, so I stick with the more obvious thoughts that the mudras represent. As I start out, I take a moment to center myself and make myself present, then start with the mudras. I hold each position for 4 deep breaths and repeat the cycle a total of 3 times. We’ve recently been talking about cleansing rituals (called Misogi) and this has become my ritual of Misogi. Hands joined together, as in prayer. Palms are not touching and creating space in between – This is symbolic of the womb. A place of creation. The first mudra is a great way for me to focus on the creation of a new day. It allows me to feel the fullness of the womb, insulated from outside, comfort, warmth, and safety. Left hand facing, right hand on top. Palms together at heart level – This mudra represents the Ying and Yang. Form the Tao Te Ching, the Tao produced the one, which gave birth the two, which gave birth to the ten thousand things. This allows me to think about my duality, my left and right, forward and back, up and down, dark and light. If indeed the tao made the one, and the two, then I have aspects of duality as well. This practice gives me the ability to hold the two close at heart and accept the totality of who I am. Fingers interlaced, index fingers point and touch at the tips, thumbs line up next to each other, hands at heart level – Signifies direction and intention. This brings focus and singlemindedness of thought. This is a great tool for me because by the very nature of my job, I am constantly multitasking. I believe that this will help me find another way to work. Hands are slightly below the belly button, both hands face up, left sits over right, thumbs come together and almost touch – There are many circles that come into play in this mudra – the belly button, the circle that the hands and thumb form, the circle the arms form. I think about the cyclical nature of things, how efficient movement is circular, and the relationship of circles to spirals and back to circles. 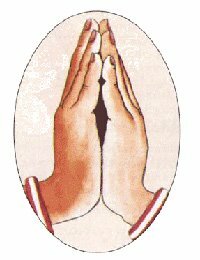 Hands come up to heart level, palms are together as in prayer – This is simple but beautiful, the mudra allows me to think of center. The hands held together gives me a great sense of devotion to God and the universe. This helps open me up to the sacredness and beauty of all things. At the same time helps support me and hold up my center. Hands are held up at heart level, palms are facing up, edge of the hands come together – Another simple but beautiful position, this is the mudra of giving and receiviing. Holding this position reminds me of both the act of giving and receiving. Both are equally important. The giving but also the receiving of help, service, gratitude, love and kindness holds relavence for me. Sometimes I’m not good at either, sometimes I’m good at only giving, or only receivng. The palms open can be held equally for both. This is a great reminder for me and a great way to focus my minds eye on the act of giving and receivng. Arms are extended and hands come together palms out, tips of the index finger are touching and the thumbs come togeher to make a triangle space,. this allows my gaze to focus through the space at a single focal point – This is symbolic of Mind, Body and Speech (thought). This is another way for me, similar to the thrid mudra, to think of a singularity of purpose, it allows me to concentrate on how Mind, Body and Spirit come together and integrate to bring my uniquely human experience to light. Hands togehter at heart level, fingers interlace tightly – Finally, as my fingers interlace, I think about all these things, center, devotion, masculinity, feminiity, dark, light, devotion, love, service are tightly woven to make up the totality of “I”. It allows me to concentrate on the bigger conncetions, how there is no randomness, no coincidence, how I am connected through love and light to alll things. One of our teachers, a friend of mine that teaches at our Aikido school talks about the fact that when we perform cleansing rituals, we give power to the rituals we undertake. That said, everything can be a ritual if we choose to make it so. This gives me great comfort in seeking out my own ritual of Misogi.